Evan’s Collision Center specializes in repairing, installing, and replacing windshields. We can replace any glass to fit: trucks, sedans, vans, SUVs, and commercial vehicles. If your previous windshield was tinted, we can match the tint of the glass as well. If your windshield is scratched, our Lumsden windshield repair specialists use industrial grade acrylic scratch remover to buff them out so you can see clearly again. First, a paste is applied to the scratched area; then a drill with a polishing wheel attachment is used to smooth out the scratched area. Small windshield chips or cracks the size of a quarter or smaller can often be repaired without replacing the entire windshield. These types of blemishes usually occur when flying debris such as rocks hit the windshield at high speeds, or a minor impact causes the windshield to crack. Using a resin and professional repair tools, we’ll fill in the chip or crack so it looks new again. 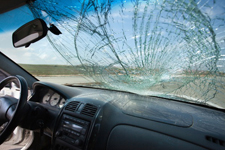 Evan’s Collision Center also replaces severely cracked or shattered windshields. If you’ve been in an accident, we’ll work with your insurance company to cover costs according to your policy. We begin by removing all pieces of the windshield that are still attached and vacuuming any broken glass from your car’s exterior and interior. A new windshield is installed from our inventory or custom ordered to fit your vehicle. We use the most efficient installation techniques, high quality glass, and adhesive so you can get back on the road as quickly as possible. If your windshield needs a repair, bring your car into Evan’s Collision Center in Lumsden.